Sometimes, to make a living, you have to get creative. 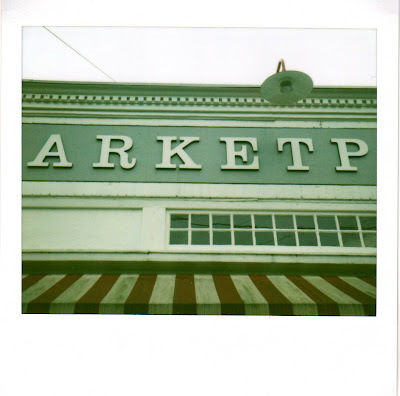 Chris Fischer's great-grandfather, for instance, used to own a store downtown in Chilmark. When he started to have a family, he bought a cow so they'd have milk. Nine months later, there was another child on the way and the cow was dry—carrying a calf. So he bought another cow, and another one, and before long, he had a whole herd of cows and children and the store was shuttered up. He became a farmer instead. Four generations later, Chris is trying to find his niche. At first he thought maybe that was off the farm—off the Vineyard in kitchens in places like London and Rome and at Mario Batali's place, Babbo, in the city. But a few years ago, he came home. Beetlebung Corner and the land his family's been farming for nearly a century now was simply in his blood. He would have to get creative to make it work, he knew, and so he did. He devised a business planting backyard gardens for other people, and cooking what they grow. He helps families design, install, and maintain summer vegetable gardens, and then if they like, acts as family chef. At one place he's even put together a miniature farm—pigs and hens and fruit trees and a strawberry patch and row upon row of lettuces and peas. His days are a string of digging and checking and planting and turning on sprinklers and hunting for cucumbers and zucchinis under the leaves. He's doing what he always wanted to do—farm—it's just a little more spread out these days. Still, if you get to work with produce like this, that seems like a pretty good compromise to me. Plus, as Chris points out, when he acts as chef, he gets to use not only what the family has grown, but also produce from his own farm and others around the island. This means he's able to make his income do doubletime when it comes to promoting and supporting local food. He still maintains his own plot and sells at the West Tisbury Farmers' market on Wednesdays and Saturdays, and he also does some t.v. clips—a segment with Plum T.V. called Edible Island—that go even further towards this goal. He goes on a food foraging adventure—picking produce or fishing off Squibby or visiting a farm—and then cooks a meal with the fresh, local stuff they find. He has all sorts of recipes, for things like patty pan squash salad and stuffed fish and ox tongue with salsa verde. I haven't had the time, er, ahem, the courage to try that last one just yet, but almost. In the meantime, if you get curious, you can peruse his selection over here. 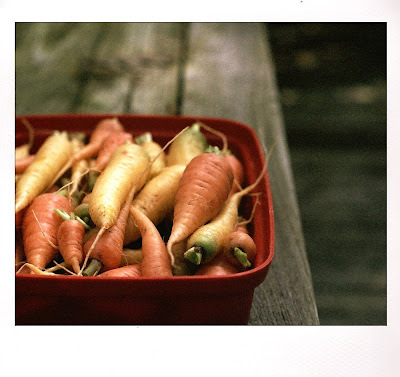 There's also a 10-step guide to a successful vegetable garden, and a composting manual, both of which I think you might enjoy. Now if you'll excuse me, I have a garden to weed. Well. We're going to try something new around here today. I was invited, a week or two or maybe three ago, to a party. Only it wasn't a party with girls in paisley sundresses and men with freshly shaven beards and real live potato salad and glass bottle beers that sweat in your hands. It was an online party—a potluck for bloggers, organized by my friend Tara. Here's where I'd like to host my end of things: at the Wellfleet harbor, down on the dock, staring out at the sailboats. Don't you think that'd be a nice spot? Anyway, I first met Tara a few months ago, at a food writing symposium in West Virginia. We stayed in a schmaltzy hotel tucked into the Allegheny Mountains and sat around in Dorothy Draper chairs talking about voice and photography and persona and drinking way too much Kentucky bourbon until way past my bedtime. 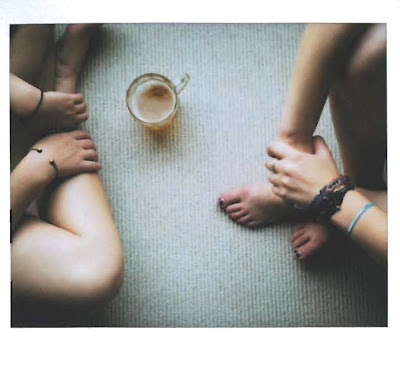 It felt like the kind of friendship you make at summer camp— all fast and furious and then suddenly gone. I knew, though, the day I got a handwritten note on Tara Mataraza Desmond stationary just to say hello, that we were going to make it. And though I'm not sure an online potluck quite counts as seeing someone again, for now it is just about as close as we're going to get. So Tara gathered up a whole group of bloggers, some from the symposium and some from the other corners of her life, and sent us each a recipe from her new book. The official date is set for Wednesday, but since what we do around here today will still be around tomorrow, I decided it was okay to jump the gun a bit. Also, to ask someone to wait to talk about a recipe like herbed cream cheese on rye toast with cucumber pickles and smoked bluefish is a little much. Especially on a day when the harbor looks as breezy as it does above, and when the air inland is so heavy it just might melt you if you try to do anything chef-like, like, say, turn on the oven or heat up a pot of soup. Days like today are just meant for sandwiches like this. The sandwich is from Tara's book, Almost Meatless. It's a stack of toasted rye, a spread of cream cheese that's been whipped up with fresh chives and dill, a layer of quickly-pickled cucumbers, and then just a sprinkling of smoked bluefish. Her book is all about how to eat meat without eating too much of it, and this recipe is a very good representative as far as I can tell. All the recipes are toned down carnivorous dishes, with chapter headlines like a Bit of Chicken and a Taste of Turkey and a Little Fish and Seafood. It's the sort of cooking I tend to do anyways, not really because I don't like meat, but because I get so involved with things like kohlrabi and dinosaur kale and the fact that four strawberry plants will send out enough runners to make a patch that I sort of forget about the chicken and lamb in the freezer. There's nothing too tricky about putting it together, although it's a good idea to take the cream cheese out of the fridge first thing. Otherwise you might forget, and between waiting for the pickles to marinate and the cream cheese to soften, you might have a rather terrible low blood sugar moment and threaten to step on your dogs' toes. And it's an even better idea to start the cucumbers pickling in the morning, over a bowl of granola. Beyond that, there's nothing to it. 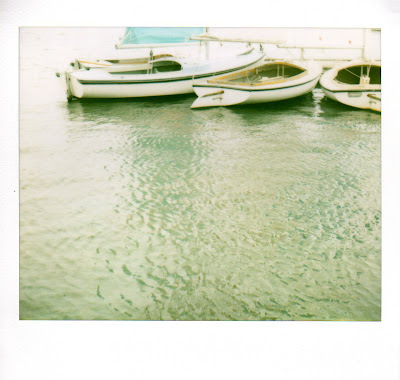 So bon voyage, and I'll see you at the harbor. I changed Tara's recipe around a little bit to fit what I had on hand. Her recipe calls for smoked whitefish, but I used smoked blue. I absolutely adore bluefish paté, and the fresh smoked blue with the whipped cream cheese, chives, and dill is an absolutely perfect match. Also, Pan d' Avignon in Hyannis makes a killer rye bread. They sell it all over the place—at the Hyannis farmers' market and the Wellfleet Marketplace and I think Hatch's, just to name a few. Take the cream cheese out of the fridge, and set it aside on the counter. Swirl together the sugar, salt, and vinegar in a small mixing bowl, and then dump the cucumbers in. Mix well and put the bowl in the fridge for at least half an hour while the pickles marinate. Get out an electric beater and the hopefully-soft cream cheese, and spoon half the tub into a bigger mixing bowl. Throw in the dill and the chives and beat everything together until the mixture takes on the consistency of the whipped veggie cream cheese they have at very good bagel places. 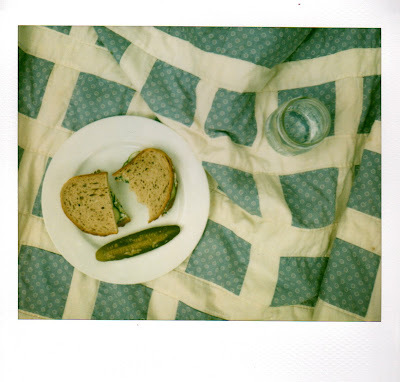 Toast the rye bread, pull out the cucumbers, and then assemble four sandwiches as follows. Spread half the pieces of toast with a good thick layer of cream cheese, crumble an ounce of the bluefish on top of each, and for every piece of toast with cream cheese stack on a layer of cucumbers and a tomato slice and a broad leaf of lettuce. Now press the four plain piece sof toast on top, slice in half, and enjoy, if you're anything like me, with one of your mother's homemade pickles on a quilt down by the water. P.S. If you're interested in finding out who else will be potlucking tomorrow, you can head on over to Tara's blog in the morning. She'll be making introductions all day. On a summer afternoon when you are home in Maine with your mom and your sister and your father, you might need a beer. You especially might need one on an afternoon when you have spent the morning at Staples buying cheap resume kits for their smooth ivory paper and finding just the right 11" by 15" watercolor paper for the paper cutter and thanking Mike for calling the Portland store to order six extra ten-packs of envelopes for UPS delivery the next day. Your sister and your father, who have spent the afternoon driving to the city to buy fancy sheet paper and swearing at the Deskjet might also need a one. And your mother, who might usually just split a beer with you or your father or your sister—she will need a whole one, maybe even two. Opening your own print shop can make these sorts of things necessary, you see. Of course, there are plenty of other good excuses to drink a beer on an afternoon like this. There's the way the yard smells in July, like raspberries and moss and wet wildflowers, or the fact that the sun managed to come out in time for the evening view, or maybe the worry that you still haven't booked a band, or the view out your parents' back window when the tide is low. Really, there are very few days without a whole heap of good excuses to drink a beer. Which is why we are so lucky to have our very own brewery in Hyannis, right here in our sandy backyard. Beth and Todd Marcus opened Cape Cod Beer about five years ago, back when Beth's office was in the basement of their house and the brewery was on Main Street. (It has since grown in a big, big way and moved to Phinney's Lane, where Todd, Beth, and their crew can offer tours, do paperwork, and work in the office all at the same time. Imagine that.) Before there was a Cape Cod Beer, Todd was brewing up ales for Long Trail in Vermont and Sunday River Brewing Co. in Maine and two Hyannis companies. Once upon a time, way back in 1995, he was gainfully employeed as an engineer, but that didn't last long. He went to one brewer's conference—just one!—and that was it. The thing about beer that got him was the way the chemistry came together—the way that you could combine the same four ingredients—malt, water, hops, and yeast—into endless riffs on the same theme. He loved the way that the air temperature or the drying time or the grain could produce a beer with caramel undertones, or chocolate, or maybe even spice. And the way that yeast had such a handy by-product! I mean really, who else churns out alcohol and CO2 in perfect proportions as they eat? These days, Cape Cod Beer is brewing two year-round beers: Cape Cod Red and Cape Cod IPA. These are the ones you'll find on tap at restaurants like Mac's Shack and the Flying Fish and Blackfish, where I work. Then there are their seasonal brews: Porter and Old Man Winter and Stellwagen Stout for the off season, and a bright, Bavarian style summer wheat ale for this time of year. Really, it's pretty amazing the variety we have with strictly on-Cape beers. Of course, going home is nice, too. I'm not going to mention a certain W-word again here today, but there's a brewery just over the bridge in Topsham where we'll be having an event on a Friday evening in November, and another one in Portland that will be providing a certain quantity of kegs and brown bottles filled with a maple oat brew in a big, white tent the next day. Speaking of which, I had better get back to work. If you're looking for more info on microbreweries in Massachussets, there's a good list over here. And as for pairing wine with food, well, I recommend marching right down to Cape Cod Beer and talking with Beth and Todd yourself, but if that's a bit out of the way for today, why don't you go on over here instead. Everyone, say hello to a Mr. Black Currant. He's sort of an outlaw around here, a rabble-rouser of sorts, but he's worth getting to know. So are his cousins, White and Red. Black Currant got into trouble when he started bringing White Pine Blister around—a miserable, highly contagious rust that can cause a white pine tree to heave its last breath. Red and White and another cousin, Gooseberry, got in on it too, and trees started keeling over left and right. These were tall, stately, important trees—ship's masts and dining room tables and whole staircases worth. So the government intervened, told the whole Ribes family to pack their bags and leave almost every state in the U.S. The worry, of course was that the tart, juicy berries would topple whole commercial forests, collapsing an industry as they went. Instead, they collapsed the berry supply. Sixty years later, in 1966, once the hubbub had quieted down, the feds shifted the decision to the states' realm, letting them decide whether they were comfortable with the berries or not. In New York in 2003, nearly a century after they'd been sent away, the outlaw Black Currant was let back in. Vermont, Connecticut, and Oregon followed suite, but the rest of New England still hasn't allowed that. For the other members of the family—Red Currant and White Currant and Gooseberry and even a fellow they call Jostaberry—Massachusetts has a tangled, tricky set of laws: they're banned in 137 cities and towns statewide; anyone else is free to go online and order up a plant. But this really doesn't help much. As you might imagine, between all the yellow tape and the hunting around for legal terms, the Ribes berries still aren't particularly popular. Hardly anyone grows them, and those that do tend to eat their whole stash or turn it into jellies and desserts. Except for Andy Pollock, who grows in Dartmouth and sells at the farmers markets in Provincetown and Falmouth and Vineyard Haven and Plymouth. He has the tangy red berries, the dark, veined gooseberries, and the ivory, champagne-tinged whites. He started growing them, he said, because they were unusual, and this year the plants will turn three. He sells the fruits in tiny, 1/2-pint containers, for $3 and $4. He says it depends on the day—sometimes they sell like hotcakes, other mornings they hang around hour after hour, languishing in the heat. He looks for Northern Europeans—Brits or Swedes or Ukrainians—because they know the fruit well. Over there, currants are still prolific, common wild and in markets all summer long. Here, between the bans and our preference for sweet over tart, we never really got acquainted very well. It's a shame we didn't, because though they might be rabble-rousers, currants are good. The red ones are good plain, in a pop-in-your-mouth sort of way, and the white ones are excellent in a glass of champagne. The black currants I find a bit strong, much better suited to topping a lamb chop or a duck breast as a rich, simmered sauce than to eating raw, but good nonetheless. As for the gooseberries, well, I think they fall somewhere in between. I'm still very much in that awkward, getting-to-know-you phase with these fruits, but one thing I do know is they make very good jam. I tried my hand at a batch the other day—half red currants, half white currants, and plenty of sugar—and it came out just right. Currants naturally have plenty of pectin, so it was a breeze to set, and the flavor is the perfect balance of tart and sweet. There are more ideas for what to do with currants over here, but if you're just getting introduced, this jam is a very good place to start. Most people make currant jelly, not jam, because they don't like the seeds, but I've always preferred to leave them in. (Call me crazy, but that feeling you get when raspberry seeds are stuck between your teeth on a lazy summer afternoon? It makes me absolutely delirious.) If you're more of a goes-down-smooth type, this recipe can be easily adjusted. Simply heat up the berries alone, without the sugar, and once they're soft, strain out the seeds and skins. Save the juice and for every cup of liquid add a cup of sugar. Cook the mixture over the stove in a small, heavy-bottomed pot, following the instructions below for figuring out when it has set and is ready to put into jars. This recipe doesn't make much—just about a cup of jam—but it can be easily multiplied. I didn't buy many currants, as they're kind of expensive and I wasn't sure just yet if I would like the results of this jam foray, but I can now say that it was well worth it. In fact, next time I think I'd buy at least a quart of berries, maybe even two. Oh! and I wouldn't try this with black currants, if you can find them, because they have a very, very different taste. Gooseberries might be okay, but I think I'd mix them with red currants for that characteristic bright taste. Combine the berries, sugar, and water in a small, heavy-bottomed pot. Cook over low heat, mashing the currants into a pulp with a ricer or a fork as they cook, and stirring until the sugar is dissolved. Bring to a gentle boil and simmer until the jam sheets off a spoon. Take care not to overcook it, as currants have plenty of pectin and can firm up a little too much, into a substance much more like rock candy than a condiment if they're left on the stove too long. Pour the hot fruit mixture into a Mason jar* and let it cool overnight. It makes an excellent topping for a hot English muffin with butter, and is also good combined with a bit of horseradish and mustard as a sauce for rich meats like beef and lamb. *Be sure to take the proper sterilization steps for the jar and the lid if you're planning to keep the jam in the cupboard; these instructions are intended for a jar that will be tucked into the refrigerator and eaten up very soon. I would like to announce that Great Pond, in the summer time, is a magnificent place to be. Here are my toes, bearing witness. It is especially lovely on a Saturday afternoon in July when you've spent the morning at the farmers' market (where there were carrots, no less! ), passed mid-day at an ocean beach, and when your best friend is in town from 3,000 miles away. That, people, is the sort of magnificence I'm talking about here. Clumps aside, the shortbread making is really no trick at all. The cakes are just flour, butter, sugar, salt, and baking soda, with a bit of milk whisked in. Seriously, that's it. The berries aren't too tricky either—the blueberries freshen things up while the strawberries provide just the right amount of ooze—and then all that's left is the rather substantial dollop of whipped cream on top. The trickiest thing about red-white-and-blue-shortcake, really, is rounding up the friends. What with the plane tickets and the getting-the-night-off requests and the drives down from Boston, it's much more of a bother to get everyone together than it is to whip up a few shortcakes here and there. But on Saturday night with the friends—the rounded up ones who are able to remember stories that start with the the Fourth of July you made out with a boy in an alley and progress to conversation about the cut of your wedding dress—on that sort of night, red-white-and-blue shortcake is a very good thing indeed. Just be careful not to wear anything too close fitting, because between the laughter and the shortcake, it might not make it home in one piece. This is a very versatile biscuit, adapted from Alice Waters' cream biscuits in The Art of Simple Food. They are equally good toasted for breakfast with a dab of butter and jam as they are drenched in berries and juice and topped with a whopping dollop of whipped cream, so it's a good idea to make more rather than less. Preheat the oven to 400 degrees F. In a medium-sized mixing bowl, whisk together the dry ingredients. (Watch out, ahem, for those baking soda clumps!) Cut the butter into the flour and then, using your fingers, work it into pea-size chunks. Pour in the milk and stir everything together with a fork until just combined. Butter two baking sheets and, using two soup spoons, drop the batter on in lumps roughly 1 and 1/2 inches in diameter. (There should be eight in all.) Bake for about 15 minutes, or until golden brown. Cut each biscuit in half and top it with fresh whipped cream and a mixture of half and half blueberries and sliced strawberries. (Frozen strawberries are fine, both since this year's crop hasn't been very good and because they offer up a nice amount of sweet juice, but if you can find fresh strawberries, slice them up, put them in a bowl, and sprinkle them with a few teaspoons of sugar. Within about 15 minutes, they should produce a nice puddle of juice.) Happy July! Strawberry season, in my family, is a religious thing. We pick strawberries in late June and early July the way other families watch Wimbledon or take Saturdays at the beach—every year, all together, no matter what. 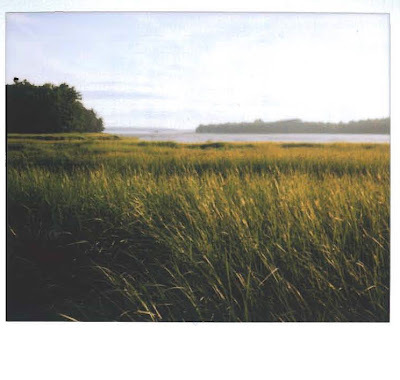 We wake up early, at seven or even six, and we drive out to Bowdoin, a few towns over from where I grew up in Maine. We bring our stained green quart containers from last year and our sunscreen and our hats, and we haul flats of empty boxes down the rows at Prout's field until they're picked full. We pick until our fingers are stained and our lips are red, and we make sure to get forty quarts at the very least. 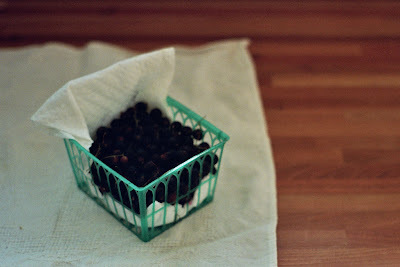 Then we haul the berries back home, lay them out on the kitchen counter like checkers, and everyone takes their spots. My father pulls the greens from the berry heads, my sister washes, I chop. My mother pulls out the big pots for jam—the jars in a water bath on the back burner and the sugar and the berries bubbling up front. We make pint upon pint of jam, to last all year on toast and peanut butter sandwiches and stirred into plain yogurt sometimes. 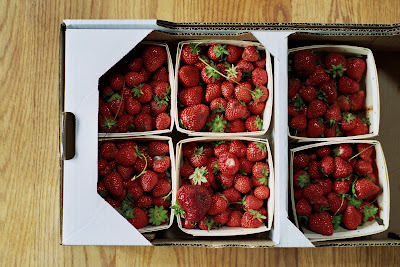 This year, between the rain and the hail and the grey fruit mold—between those three, the strawberries were done in. There were some berries at the markets, certainly; they were big, plump, and juicy, and they had hardly any taste. They could have been California strawberries for all we knew. I talked to Tim Friary about it the other day—Tim from Cape Cod Organics Farm in Barnstable who sells the berries at the markets in Hyannis and Orleans. He said he'd lost 150 cases by mid June, $6,000 down the drain. He said they just melted—ashes to ashes, dust to dust. But it was the terrific lack of sunshine that got them the most. The strawberries come in June for a reason, he explained: they rely on the longest days of the year, on the peak of light and loads of sunshine to get that sweet, signature taste. Needless to say, they got hardly a single day. Still, we've eaten a few. We've brought home a quart here and there from Tim, or from Andy Pollock in Provincetown, and we've doled them out on tip-toe. Mostly, we've been stretching them out on salads. 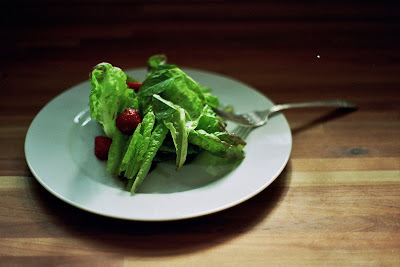 That one right up there is one of my favorites: butter lettuce, basil, and balsamic with just a sprinkling of strawberries. They go on a long way on salad, strawberries do—you only need two or maybe three to make the whole thing jump. The basil doesn't hurt, of course—it's been thick with strawberries since ages and ages ago—and the balsamic makes an excellent third wheel. But the strawberries are the ones that round up the troops, bringing together crisp and peppery and floral into one big, ecstatic bunch. It may not feel like a big, ecstatic bunch sort of season in general, I know. 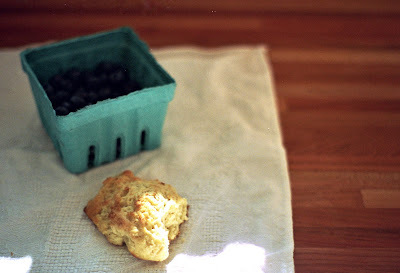 But for this last week—before the berries disappear until next year—I plan to revel in the possibility all I can. There might not be enough strawberries for jam, but there are certainly plenty to top a salad. Basil and strawberries are a well known pair, and the balsamic in this recipe compliments both. Look for a mild lettuce without too much of its own personality—that way the basil and berries won't have anything too strong to compete with. Toss lettuce and basil together in a large serving bowl. Dress with oil and vinegar, and season with salt and pepper to taste. Add the strawberries last, sprinkling them on top, so that they don't disappear to the bottom too fast. P.S. This year, I planted my own strawberry patch. Luckily, I wasn't counting on any berries just yet, but the plants sent out runners all over the place, and from just six plants they've nearly filled in a 10 foot space. Spring and August are the two best times to plant, so if you have any interest in getting a patch going, I recommend doing some research over here first. There are all sorts of tid-bits about choosing varieties and how to mulch and what not. Good luck! I hope you had an excellent Fourth of July. I hope it was filled with sun and burgers and pickles and mojitos, and maybe even a swim in the bay. I also hope it got you ready to dive into summer full-gale, with a bang, because that's the sort of recipe I have to offer you today. I want to talk about white sangria today, specifically about the recipe I clipped from last month's Gourmet, the one that spent an entire four weeks begging for a sunny day before I finally dug it out on Thursday. If that was the editors' idea of a joke—if they thought it was funny to taunt the entire northeast with their gorgeous-men-and-women-drinking-on-a-river spread for a whole four weeks while thunder, rain, and hail pounded down from the sky—well, ha. ha. I like to think I have a pretty good sense of humor about these sorts of things, but that was simply not funny Gourmet. Happily, as of Friday at least, we have decided to move on. We are full-sun ahead, and we have some serious make-up work to do in the realm of beach fires and pond swims and Sunday barbeques. The hosting rules for any of these sorts of outdoor festivities—at least at my house—clearly state that they ought to involve a pitcher of sangria or two. And this white sangria—this white sangria is just the thing. It's actually more minted than white—with just fresh mint leaves and sugar and brandy and a bottle of dry white wine—and it goes down crisp and smooth with just a little hint of tang. It is a sort of cross between sangria and a mojito when you get down to it, and for a hot day in July, it is just the thing. Originally, the recipe debuted in the July 1991 issue of the magazine as Minted White Sangria. The editors brought it back this summer with green grapes and green apples to jazz it up a bit, but between you and me, those new fruits didn't add much. They were just a lot of noise in comparision to the mint. I tried making it both ways when the sun came out Friday and I have decided to stand staunchly beside the mint-stands-alone 1991 version as my permanent pitcher of choice. Of course, now that the sun's out, there's plenty of time to try sangria any-old-which-way. You'll have to let me know what your favorite version is, so that we can give that a swing. 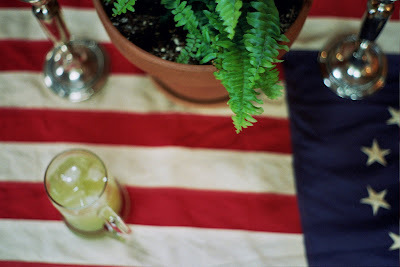 This is best served freezing cold from a pitcher and poured into mint julep cups over ice. If you don't have the silver cups, chilled glass beer mugs work well too. Garnish each glass with a sprig of fresh mint, or, for a lighter sangria, add a splash of soda water. In a mixing bowl, combine the mint, sugar, and several tablespoons hot water. 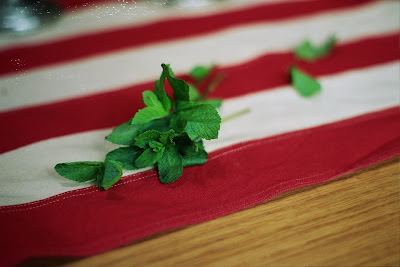 Stir with a wooden spoon until the sugar is dissolved, using the spoon to muddle the mint. Add the brandy and the wine, stir well, and let the mixture chill for several hours. Strain the sangria into a pitcher just before you're ready to serve it, then pour it over ice into individual glasses and garnish with a sprig of mint. Imagine, for a second. Imagine you've left the house you grew up in, the soil, the land. Imagine you've left tias and tios, a language, a country, the garden out back. You've left behind plates of feijoada, a burning sun, kitchen spoons and mixing bowls, the memory of okra and maxixi and a hundred other tropical plants not found under the waning New England sun. Imagine you have left Brazil—Maranhao maybe, or Minas Gerais—for Martha's Vineyard, imagine you have exhanged the equator for this tiny wind-tattered arc in the midst of the North Atlantic. Imagine remembering each time you sit down to eat that though the island is beautiful and busy and the work is steady, there is no place like home, no taste like home on a dinner plate. That taioba plant would be a sight for sore eyes, indeed. It's not that there aren't substitutes for taioba—there are, spinach for one—but just like Swiss chard is no kale, they aren't quite the same. Taioba is a staple in many parts of Brazil, the kind of leafy green you chop and cook up alongside a bowl of rice or maybe a hunk of bread. It has broad, sloping leaves that sprout out like sun umbrellas, a patch of shade for the spiders and the ants and the cabbage worms of the world. 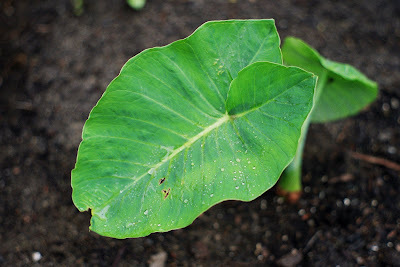 Some people call it malanga, or yautia, or even cocoyam, just as they do its cousin taro, but taioba's the most common name. It got to the Vineyard through Island Grown Initiative, a non-profit that Ali Berlow started. (Ali, in case you don't know her, is the brilliance behind A Cook's Notebook and, along with her husband Sam, the new Edible Vineyard.) IGI works to connect local people to local food, so connecting the roughly 4,000 Brazilians on the island with familiar crops was a big no brainer once they heard about Mangan's work. Beyond taioba, the collaboration is bringing other Brazilian crops to the island, too. There's also maxixi, a lemony, cucumber-like fruit, jilo, a member of the Solanaceae family that has fruit sort of like a green eggplant, and okra, with its long, spindly lady finger fruits. The hope is that not only will Brazilians be excited to see a taste of home, but that other islanders will catch on, too. We could all do with a new salad or two. The taioba plant I brought home is still pretty small—only a foot or so high—but to tide us over, one of Mangan's students, Zorraia Barros, offered up a recipe for Taioba Sauté. Once the crops start coming in, taioba should be available at the West Tisbury farmers' market on the Vineyard, and a few markets in the Hyannis area, too. So keep your eye out, and don't be afraid to step outside the lines. Taioba might not taste like home, but I'm betting once you take a bit, that won't matter much. Many thanks to Zorraia Barros of the University of Massachusetts Amherst for this recipe. Zorraia works with Mangan on his program and specializes in nursing and marketing little taioba plants. She developed this recipe in both English and Portuguese, which seems very appropriate to me, so I'm going to offer both versions here. The English one is a bit edited, but the Portuguese—well, let's just say I thought it best not to mess with that. So without further ado, meet taioba—in print now, and one of these days, at a farmers' market near you. In a large black-bottomed skillet, heat up the olive oil. Add the onions when the pan is hot, and sauté for about five minutes, or until they begin to get translucent and soft. Turn down the heat and add the garlic, stirring constantly for about 30 seconds or until it is just on the cusp of getting too brown and burning, and then throw in the taioba. (The green, Zorraia says, is very delicate and will cook down to about a quarter of its original heft.) Stir it around for about five minutes, until the leaves are wilted and soft, sprinkle with salt, and serve. Lavar e perparar os vegetais. Numa frigideira grande aquecer o azeite de oliva. Adicionar o alho e a cebola, refogar por 1 minuto. Adicionar a taioba e refogar por 5 minutos ou ate ficar macio (a Taioba é muito delicada para cozinhar, no inicio temos 2 xícaras de folhas frescas e termina com 1/2 xícara de taioba refogada). Adicionar o sal e servir.